Educational Qualification: B.E./ B. Tech. (Mining) with Minimum 55% & DGMS 1st Class Mines Manager (Coal) Certificate. GMDC Selection Process: Selection will be through Interview. DGMS Mine Sirdar/Mine Mate certificate . GMDC Selection Process : Selection will be through Interview. 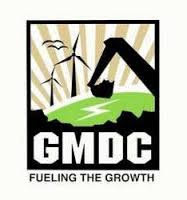 Application Fee : Candidates have to pay Rs.200/- through Demand Draft in favour of GMDC LTD. Reserved category candidates belonging to SC, ST & SEBC are exempted from payment of application fees.